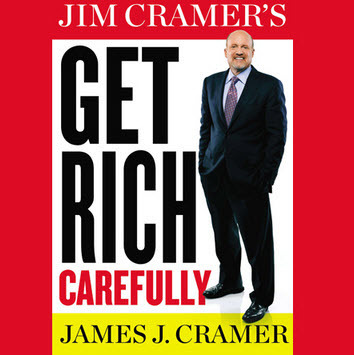 On Wednesday night, Ken Kavula, Nick Stratigos and I participated in a “book club” program delivered by NAIC/Better Investing featuring Jim Cramer’s Get Rich Carefully. We were joined by Eve Lewis and the panel unanimously felt the book is a worthy read for long-term investors. Booyah. Jim Cramer surprised me. I didn’t expect the book to be this good. The end result is a profile of a matured/maturing investor. Jim started with Goldman Sachs, learned a great deal from one of the most successful investors of all time, Michael Steinhardt … went on to manage his own hedge fund and ultimately become the influence that he is today. The preface alone is worth the price of admission. Cramer covers the turbulent and challenging landscape facing should-be long-term investors today. The breach of trust, shenanigans and continuing nuisances of high frequency trading, dark pools and opportunists with too many brain cells and too much time on their hands persists today. As George Nicholson, grandfather of the modern investment club movement, would most probably remind us: “It’s incumbent on us — all of us — to rise above this to champion better futures for the people we care about.” Buying excellent companies when they’re on sale — and holding them for as long as it makes sense to do so — is still relevant. Perhaps even urgent based on the accompanying illustration of recent trends. Ken Kavula speculated that Cramer is absolutely a closet investment clubber. He largely focuses on core stocks, seeking and owning leadership companies and remaining vigilant for opportunities in several general themes. He also suggests that it’s OK for investors with experience and risk tolerance to stretch and reach for opportunity. This is absolutely consistent with Nicholson’s admonition about seeking high-quality core holdings as the strategic foundation of our portfolios while allowing for speculation and “playfulness” with a suitable portion of our portfolios, for example 10% of total assets. In that context, the Cramer on CNBC and in current publications often takes the persona of the higher flying risk taker. (Some of this is assuredly related to audience and appetite.) His entries in the current Groundhog Challenge, were compiled from his 20 stocks for 2015. Cramer is currently high on the leader board. Cramer cites the non-farm payroll data as the report that he finds most influential. He keeps a close eye on this. The power and potential of community investing is nothing new to us. Results matter too. I’d really like to see better long-term performance from the Action Alerts Plus portfolio — perhaps a little more of that Steinhardt magic/advantage or some of that portfolio design and management magic experienced over seven decades by many of us.